Director: Makhnach L., Sarakhatunov B. Operators: Gorbatskiy V., Kuzminskiy S., Maksimov L.
About Mikhail Gorbachev's trip to the Far East. 1 hour - Landscapes. Vladivostok: streets, port, and a monument to another. Gorbachev attaches to the flag of the city the Order of Lenin, stands. Gorbachev and others lay a wreath at the monument to Lenin, by talking with people, examines the mother ship, the Far East, talks with workers on the deck. 2 hours - Gorbachev and others in the shop "Ocean", the exhibition, with the Chairman of Executive Committee visits new building in Vladivostok. G. Find: street, port. 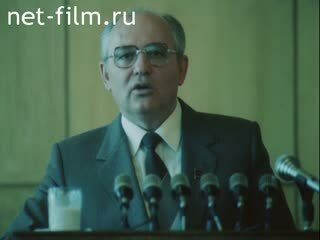 3 hours - Mikhail Gorbachev speaks with residents of Nakhodka, speaking from the podium, gets acquainted with the exposition, Far Eastern Geological Institute, advocates. 4 pm - Parade of ships of the Pacific Fleet: Ships on parade, the government Tribune, firing from the ships, floating tanks. Gorbachev lays flowers at the Eternal Flame. 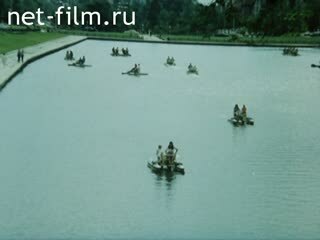 Khabarovsk: street, fountains, parks and more. 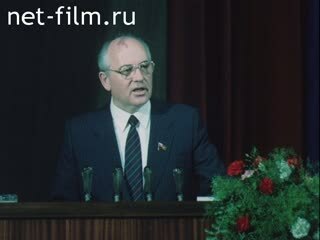 Gorbachev speaks at the Party active. 5 hour - Komsomolskaya Street, the monument pioneers. Gorbachev speaks to the gathering at the monument. Visit the farm "Krasnorechenskij" Khabarovsk Krai. Solemn meeting with the "bread of salt", conversations with farmers and director. State Farm: dairy complex, barn, pastures, houses. Peter the Great Bay - LS. Sea of ​​Japan - LS., Hitting. Sunset on the sea - LS., Hitting. Wedge of cranes in the sky - LS., PNRM. Elk in the woods - LS., PNRM. Bear in the woods - MS. The fish in the river - CU., LS., PNRM. Blooming lotus - MS., PNRM. Nakhodka (away) - LS., PNRM. Ships in port - LS., PNRM. The monument to the Civil War: the sculpture with the banner of the Red Army - MS., Leaving the city. Report on the city - different. Street decorated with flags - LS., Departure. A solemn meeting on the occasion of awarding of Vladivostok: the assembled stand and applaud - LS., PNRM. 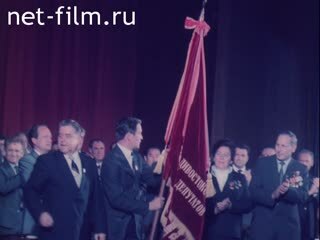 General Secretary of the CPSU Central Committee Mikhail Gorbachev and others on the podium - MS.
MS Gorbachev attaches to the flag of the Order of Lenin, congratulates Secretary of Party Committee, acts (synchronously). Order of Lenin and the October Revolution on the banner - CU. Monument VI Lenin at Station Square - MS., LS., PNRM. Cars drive up to the monument - LS., PNRM. MS Gorbachev lays a wreath at the monument to Lenin - LS., CU. Port of Vladivostok - LS. Conversation MS Gorbachev with the residents of the street, in the rain (synchronous) - Various. Mother ship "Far East» - LS., Hitting. MS and RM Gorbachev visiting the mother ship, listen to the explanation accompanying. Shop factory ship - LS. ; Conveyor canned - MS., CU., PNRM. The engine room - LS., Departure. MS Gorbachev chat with one of the shop (synchronously). Workers pack cans - LS., Departure. Manager at work - LS., Departure. MS Gorbachev and others on the deck talking to the mother ship workers (synchronous) - MS., PNRM. The premises of the shop "Ocean» - LS., PNRM. Crabs, fish and other seafood on the counter - different. Customers in the store - LS., PNRM. MS and RM Gorbachev in the store - LS. Warehouse canned fish - CU., PNRM. The exhibition "Our Town", dedicated to the 125th anniversary of Vladivostok: photos of fishermen, samples of canned food, utensils, etc. - Different. 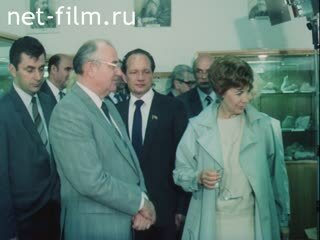 MS Gorbachev and others visiting the exhibition. MS Gorbachev talks with Secretary of Primorsky Regional Committee of the CPSU, DN Gagarovym (synchronously). New Vladivostok - LS., PNRM. Layout of building area - LS., PNRM. Continuation of MS Gorbachev at a meeting (synchronously). Ships in port - LS. MS Gorbachev talking with residents Finds (synchronous) - Various. Vostochny, guests from Moscow came to the port - LS., PNRM. Containers on the dock - LS., PNRM. Cars are prepared for shipment - LS., PNRM. Unloading at the port - LS. Operate transporters - LS., PNRM., CU. Conversation MS Gorbachev and port workers - LS., PNRM. MS Gorbachev talks with residents Finds (synchronously) - MS., Impact, departure, CU. Vladivostok area with a statue of the Red Army - LS. Continuation of MS Gorbachev at a meeting (synchronous) - Various. Hall of Far Eastern Center of the USSR: Listen to the Hall, speaker stands - different. MS and RM Gorbachev among listeners in the hall - CU. ; Examine exposure Far East Geological Institute - LS. Exhibits: minerals, jewelery from them, etc. - MS. Layout and map of the Far East - MS., PNRM. Japan: U.S. aircraft carrier with nuclear weapons on board in Tokyo Bay - LS., PNRM., Departure. Demonstration against the Japanese military threat: people in the sea in ships - MS.; Go demonstrators, police in helmets disperse protesters - MS.
Military ships and cruisers in port - MS., LS. The eternal flame in memory of the victims of Hiroshima - LS. People pray, strike the bell - CU., MS., Hitting. Street clock - MS., Hitting. Anti-war demonstration, people are protesting in the street - MS., PNRM. Pigeons flying over the city - MS., LS., PNRM. Vladivostok port, ships in port (harbor "Golden Horn») - LS., PNRM. The celebration of the Navy: a parade of ships, flags decorated - LS. Persons sailors standing in formation - CU., PNRM. Commander of the Navy Admiral VN Chernyavin accepts the report, goes troops - LS. Playing a military band - LS., PNRM. MS and RM Gorbachev and others in government platform - LS. Military parade and demonstration exercises at sea: tanks, ATVs swim to shore, helicopters over water - LS., PNRM. Sailors with flags held by the bank - LS., PNRM., Departure. Conductor of a military band - CU., PNRM. Sailors march singing "Farewell of Slav" (synchronous) - LS. Ships in the Bay - LS. Memorial "Eternal glory to the Pacific Fleet": Eternal Flame - MS.
MS Gorbachev lays flowers at the Eternal Flame - different. Plaque with the names of fallen soldiers - CU., PNRM. Report on Khabarovsk: people on the street, in a summer cafe, fountains - different. Pond at Recreation Park - LS., Departure. The building of the observatory - MS., PNRM. MS Gorbachev speaks at a meeting with party activists Khabarovsk regional party organization (synchronously). Delegates listen, take notes, applaud - different. The ship comes out of the pile - LS., PNRM. Shop factory - MS., PNRM. Cable wrap - MS., PNRM. Remote control - MS., PNRM. Working for the machines - MS., PNRM. Dip ready tractor - CU. Installers climb the tower - MS., PNRM. Urban development - MS., PNRM. On the river floats barge loaded with coal - MS.
Report on the Komsomolsk-on-Amur - different. MS and RM Gorbachev and entourage pass on the street, the people welcomed - MS.
MS Gorbachev hugs pioneer - first builders of Komsomolsk, talking with residents (synchronous) - Various. Monument of the pioneers (group sculpture) - MS., Departure. Woman says veteran Labour (synchronously) - MS., PNRM., Hitting. Building in the city - different. New homes - MS., PNRM. Komsomolsk (from the river) - LS. People on the waterfront, looking at the river - MS., PNRM. Boats on the river - LS., PNRM. 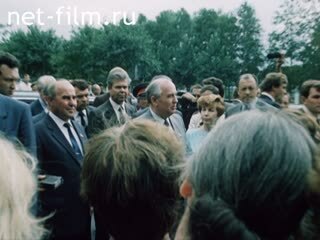 MS Gorbachev talks with residents of the plant, in an area (synchronously). Trucks are on the vodka - MS., PNRM. Cupid (the plane) - LS., PNRM. The tractor is a flooded soil - MS., PNRM. Plowing, tractor driver in the cab - MS., PNRM. Meeting MS Gorbachev and farm workers' Kranorechensky ": female head of government presents a basket of vegetables, conversation (synchronous) - MS., PNRM. The rain, people are standing with umbrellas - MS.
Cabbage field - MS., PNRM. Conversation MS Gorbachev and director of the farm "Krasnorechenskaya" LB Mazlinym (synchronous) - MS., PNRM. A herd of cows on the meadow - LS., MS. The building of the dairy complex - LS., Hitting, barn - MS., PNRM. Milkmaid milking - MS., CU., PNRM. Milking machine, the milk runs through the pipes - CU. Tractor goes round fodder in the barn - MS.
Street farm with houses of urban type - LS., Departure. The woman behind the wheel of a truck - MS., CU., PNRM. Farm workers stack boxes of tomatoes harvested cabbage - MS., PNRM. Tractor plowing - MS., PNRM. Horses in the meadow - LS., PNRM. View of the village - LS., PNRM. Exhibition: Samples of the new rural houses - MS., PNRM. The meeting of party activists in Khabarovsk - different. General view of the city (the top point).